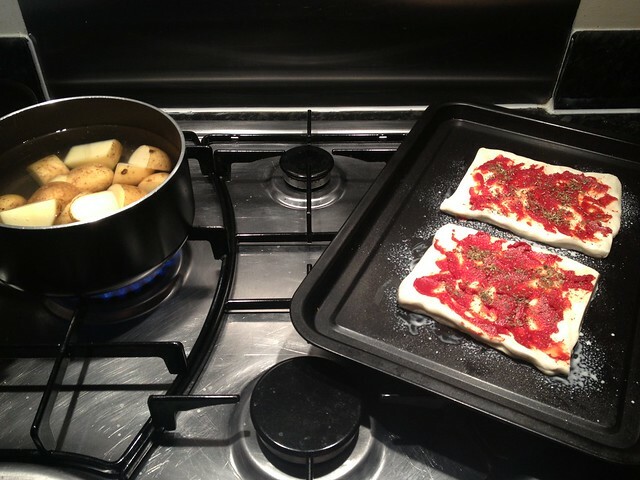 Today's post is a quick, cheap and easy dinner recipe for pastry pizzas. I made this the other night after searching through my fairly empty cupboards and fridge and finding all I had was some pastry, cheapo cheese slices, a few rashers of bacon, some potatoes and the remains of a tube of tomato puree. I managed to chuck everything together into what turned out to be a pretty tasty meal though so thought I'd share it on here in case you every find youself in a similar old mother hubbard / bare cupboards situation. 1) Cut up the potatoes into fairly small chunks (or if you're using baby new potatoes don't bother chopping them at all) and add to a pan of boiling water. Leave to simmer for 15 minutes. 2) Roll out the pastry and cut into 2 equal portions. Spray a baking tray with low-cal cooking spray before adding the pastry. 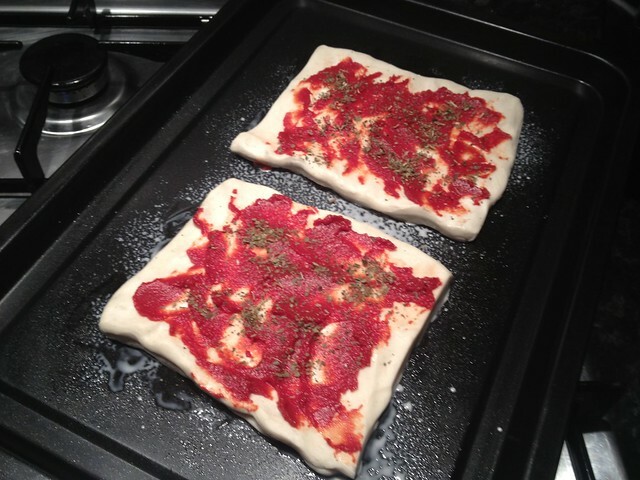 3) Spread a teaspoon of tomato puree on each pastry square and sprinkle with some herbs (I used dried basil). 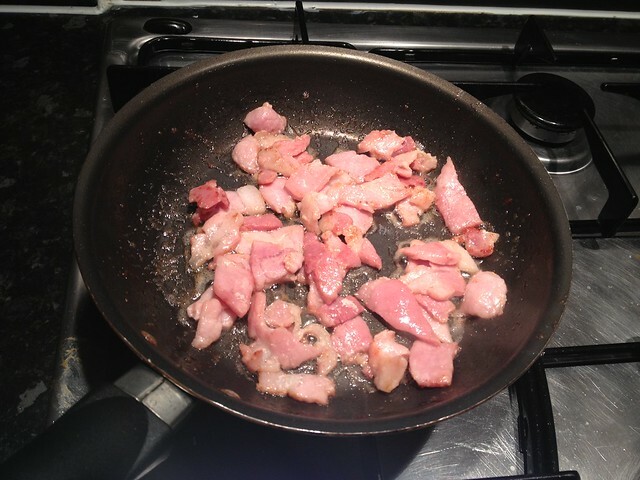 4) Chop up a couple of rashers of bacon and fry in a pan until cooked how you like. 5) Rip up a couple of cheese slices and place on the pastry so it looks a bit like a pizza. Then sprinkle the bacon on the top. 6) Drain the potatoes and put back in the pot with a tablespoon of butter. Stir until melted and then add some herbs (again, I used dried basil). 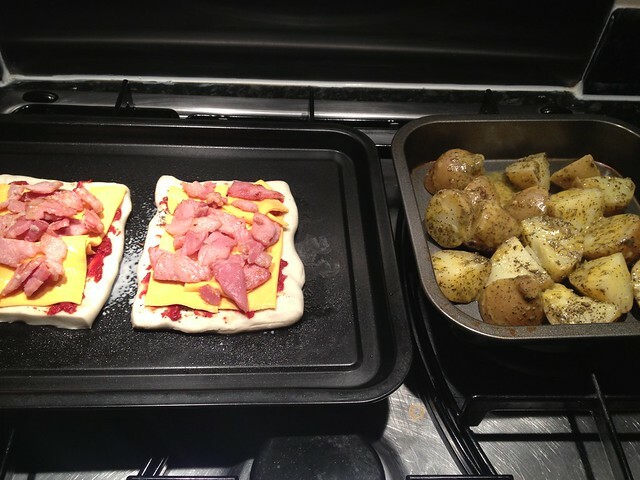 Pour the potatoes into a roasting tin and put in the oven along with the pastry pizzas. 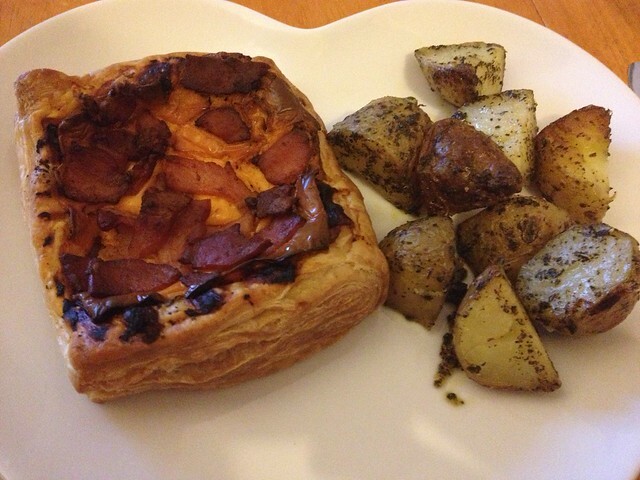 7) Cook at 200C for about 20-25 minutes (check after ~15 mins) and then providing the pastry looks ready you can serve!